Mason jar oil lamps make wonderful jar lanterns for rustic lighting. Mason jar oil lamps are one of our most popular oil lamps. 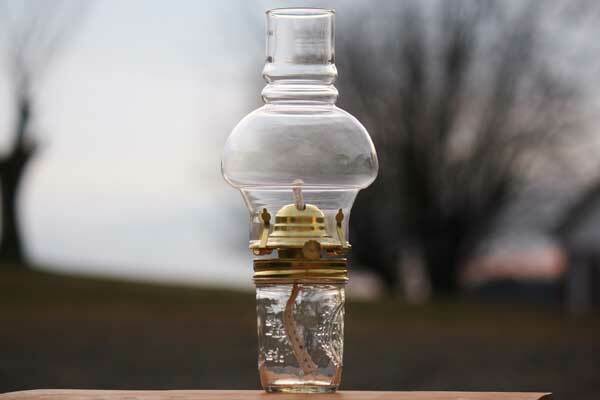 The shiny brass plated burner fits any size regular mason jar. Each lamp comes with a half pint jar, a glass chimney (BP57971C is our part number for the globe) and a burner with a wick ready to burn. The #2 burner size is rust resistant and visually striking. These mason jar lanterns will add unique outdoor lighting to any party, dinner, or event. If you already have a regular mouth mason jar jar and a 3 inch glass chimney you can purchase the mason jar oil lamp burner here.